Pooches love to play as well as gnaw squeaky dog toys, and pooch owners will find that kind of toys to be their pets’ favorite. But why do dogs love squeaky toys, what is so useful about them and do you wonder if it is worth your money to get one? If you want to know more, then read on and be informed. ​Why do dogs like squeaky toys? All fidos love squeaky toys, but why do dogs like squeaky toys with a passion? What is it about dog squeaky toys that draws out such a reaction from pooches? There are several reasons or theories that would explain such behavior from your pet. First reason or theory is that the hunting instincts of your canine are what make the animal go crazy over such toys. All pooches are descendants of wolves, and both species share a strikingly similar DNA pattern; thus both dogs and wolves exhibit and share similar qualities in their personalities. The squeaky noises that the toys make sounds that an injured or scared prey would make. When a fido hears the squeaky noises of the toy, their instinctual wolf-like drive shows up, and it will “attack” the toy. The dog will only stop “attacking” the toy when it ceases its squeaking noises. A fido playing with squeaky dog toys is simulating the act of chasing and capturing prey. The terrier, herding and sporting canines have a strong hunting instinct, and they will like the squeaking sound of a toy. Most heavy chewers are large dog breeds that started as hunting animals in the beginning, and these pooches will love chewing on a squeaking toy. The second reason or theory as to why pooches love squeaky toys is due to the immediate gratification that their actions create. Your pet enjoys the immediate reward that comes from the squeaky sound a toy being played. Your dog also knows that their bite if effective enough will produce a reaction. Lastly, your squeaky pet dog toys just because it gets your attention and it wants you to notice it. The need for a fido to draw its owner’s notice is one of the results of its interactions with humans. One thing to keep in mind about the attention-getting antics of a canine is that such actions in some cases are not favorable. If a pooch tends to chew on such toys a lot and its owner gives it little attention, then those attention-getting antics is a negative behavior. Believe it or not, squeaky toys for dogs have actual health benefits for your pet. First and foremost it’s a form of exercise to keep the canine from getting bored and mitigate any destructive behavior due to its boredom. Even if pets are domestic dogs, they still need stimulation to channel their natural prey drive. Also, these kinds of toys are excellent outlets for their chewing instincts thus sparing your household objects like shoes, furniture, etc. Also, a toy’s squeaking sound is an excellent motivational and training tool for getting your pooch’s attention and as a way of rewarding any good behavior that it displays. Lastly, squeak toys will help your pet go through its teething period since it can be a painful experience. ​Why do dogs need squeaky toys? So why do dogs like squeaky toys? What is it about such toys that make them an essential part of your doggie's life? Your dog needs squeaky toys because it entertains and motivates your pet as well as sparing your household furniture along with other belongings from its chewing jaws. Just remember that these kinds of toys will not substitute actual interaction and playtime, but are merely tools to aid you. Bear in mind that if your pet feels neglected it will chew a lot on a squeaking toy to get your attention. That kind of attention-getting from a dog is not a good one. What is better than one squeaky toy? Five squeaking toys that’s what! From Jalousie come these 5 Pack Dog Toys that has three toys with no stuffing and two plush toys that are stuffed. The non-stuffed toys are a skunk, raccoon, and wolf that comes with a squeaker on each toy. The stuffed plushies are a duck goose and monkey. Both types of toys will provide hours of sheer fun to your pooch regardless of their size. Usually, plush toys don't make good squeaky toys, but KONG Cozies Dog Squeaky Toy proves that some are an exception to the rule. KONG Cozies Dog Squeaky Toy has ten different cute characters for you to choose: Marvin the Moose, Elmer the Elephant, King the Lion, Rosie the Rhino, Spunky the Monkey, Ali the Alligator, Baily the Blue Dog, Buster the Koala, Floppy the Rabbit and Tupper the Lamb. ​If you want squeaky toys for dogs with a holiday theme, then ZippyPaws Halloween Squeakie Buddies 3-Pack toys are what you are looking for in a squeaky dog toy. The ZippyPaws Halloween Squeakie Buddies has one Snowman, one Reindeer, and one Santa all in a single pack. Also, all of the toys have no stuffing so you don't have to worry about your dog swallowing stuff that can harm it. To celebrate the holidays, get your precious fido ZippyPaws Halloween Squeakie Buddies toys. Don’t limit yourself on getting one squeaky toy for your pet if you can get more than one in a single purchase. Presenting the CNMGBB Crinkle Dog Toy No Stuffing, Durable Stuffingless Plush Squeaky Animal Dog Chew Toy Set that has three squeak toys for your pooch's use. The squeaky toys are a penguin, a fox and a skunk that will provide long hours of sheer entertainment and ease the boredom of a canine. Despite being plush toys, the CNMGBB Toys has no stuffing in them, and that makes them very safe toys for your fido. Your pet's natural hunting instinct will be satisfied, and the toys are durable as well. Are you tired of squeaky toys that are shaped like animals and you want some different for your pooch? Then you will like the UEETEK Dog Toys for Small Dogs Fruits and Vegetables Plush Puppy Dog Toys. UEETEK Squeaky Fruits and Vegetables Plush Puppy Dog Toys are veggie-shaped, and each pack has five different vegetable toys. You can find Mushroom, Carrot, Banana, Strawberry and Eggplant characters inside a pack. These cute and adorable veggie characters can aid your dog physically and mentally. Though the toys are made from plush, they are safe and durable. ​Kong maker of high-quality squeaky dog toys presents the Kong Dodo Bird Dog Toy. Though this toy is made from plush, its stuffing is minimal to prevent accidental ingestion, and it has an extra layer of durable material to make it long-lasting. Another thing that your pet will love about the Kong Dodo Bird Dog Toy is its different bright colors, softness, and cuddliness. When it comes to squeaking noises, the Kong Dodo Bird Dog Toy possesses a super duper loud noise when squeezed. ​​Making squeaky noises are not the only traits of a squeaky toy. The toys have to fun, cute and you can play with them along with your dog. Presenting the Chiwava 4PCS 2.4'' Squeak Latex Puppy Toy Funny Animal Sets that will give you and your pet lots of fun for a long time. Each of the four toys comes in different colors and various animals in the shape of eggs. You can be assured that your puppy or small dog will love playing and chewing with these safe toys while they squeak. ​The toys are not for medium or large canine breeds due to their size and the possibility of them swallowing one. ​The squeaking noise of the toys may be too loud for some people. ​​The ZippyPaws NomNomz Plush Squeaker Dog Toys are beautifully-designed squeaky toys that are of high-quality, durable and fun to play. Each toy comes in different cute food forms: Taco, Croissant, Watermelon, French Fries, Sushi, Ice Cream, Steak, and Pineapple. These plush "food" treats will entertain your pooch for hours on end. 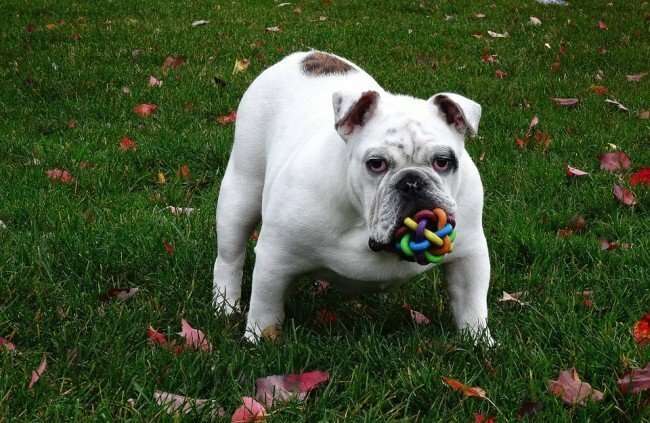 ​Can I use Squeaky Toys as a training device for dogs? ​Indeed you can see that a squeaky toy makes for a useful training tool to stoke your pet's natural prey drive by guiding it and molding its instincts to a form that you desire. Additionally, a squeaking toy serves not just a physical motivator, but as an audio reinforcement for successful training tasks. If you compare squeaker toys to some items commonly used in training, the former is superior in some ways. ​The toy is safe for use – The primary concern of any dog owner is their pooches' safety and checking if the toy is harmless both to humans and dogs is a must. A squeaking toy must be made from non-toxic material and has no choking hazards. The squeaker of a toy (the one that makes a squeaking sound) can be a choking hazard if the toy is sub-standard in quality. ​The durability of the toy – Not all pooches chew equally since some chew less or frequently, while others are aggressive chewers that will ruin anything they gnaw. For dogs that chew like there's no tomorrow, your squeaking toy has to tough enough to last for a long time. Constantly replacing ruined toys is costly in the long run. The fact may not be evident at first, but durable squeak toys saved you a lot of money. Fit for a particular dog – Just as all fidos are not equal when it comes to chewing stuff, they also are not equal when it comes to size. Large squeak toys for small dogs will not fit their mouths, while a little squeak toy is destroyed in a short time or worse swallowed by a large canine breed. The shape of the toy is also a factor. Do you want a toy in the shape of a ball, a plushie, a rope, etc.? Some canines have a preference for one form or more. Overall usefulness – Generally speaking, a squeak toy serves a training tool, motivational device, positive reinforcement, and entertainment tool. Most if not all toys have all these characteristics, so you need to worry about getting the wrong one. To be sure, inquire if the toy has all of those traits. ​Get toys that are designed for canines. Human toys have hazards unlike those made for fidos. If you have to give a human toy to a pooch at least remove anything that it can ingest or swallow. ​Remove any parts of a toy that can be ingested or chewed off like strings, eyes, ribbons or other components. Human-designed toys have pieces like that, but some doggie toys may have them. Throw away any toys that have damage since it is broken parts are now potential choking hazards. Do not even bother trying to fix or repair the broken toy. You will only make the potential risk of the toy even greater. Do not leave your pet unsupervised when it’s playing with tug-o-war toys and ropes since there is a chance that they will swallow parts of it. With your supervision, you can catch and stop your fido from ingesting the hazardous components of tug-o-war toys and ropes. Doggie toys should be big enough for canines not to swallow it and also not too big for them. Nonetheless, it’s a better option to give a dog (small or medium-sized breed) a toy that is too big for it since it can’t swallow or ingest the toy. Avoid soft toys that have polystyrene beads and nutshells since they are potential choking hazards. Also, soft toys are not durable or sturdy enough to not get wrecked by a canine especially if it is a heavy chewer. Stuffed animals are not safe for dogs due to their fillings. You can check the child safety label to see if the toy is for kids three years below since it’s probably safe to play. Still, it is a good idea to avoid any stuffed animals completely to be on the safe side. Keep an eye for signs of vomiting, lethargy, loss of appetite, painful abdomen, changes in behavior, constipation, and diarrhea in your pet since they can be symptoms that your precious swallowed something. Now the symptoms may not necessarily be due to ingested materials since it could be a common illness. But if the signs show up after your pooch damaged its toy, then it’s likely that it swallowed something. Regardless of whether your pet ingested something or has an illness, you need to visit the veterinarian is as soon as you can. Squeaky toys are genuinely one of the best behavior development tools for dogs of all types. Just make sure that you get the toughest dog toys available so that those toys can last longer and save you money from buying replacements. The term “indestructible squeaky dog toys” is a misnomer of sorts since there is no such thing as indestructible objects much less a toy. The trick to getting the right kind of toy for your pet is to get one that would fit it. A small dog needs toys designed for its breed, while Pitbull dog toys are as the name states for Pitbulls or heavy chewers. Regardless of what kind of squeaking doggie toy you get for your precious pooch, remember that toys are aids and tools in playing, not substitutes. You and your beloved dog playing will double the fun of playtime with toys.